I just got home from picking up a very happy Wylla. All went well, and she now has a bright, sparkly smile. Before we left the parking lot of the vet's office, she sat on my lap, making biscuits and giving lots of purrs, squeaks, and love. She was super chatty, and seemed to be telling me all about her experiences that day, and some of the weird dreams she had under the anesthesia. As soon as we got back to the house, she had a little snack, then said hello to Bean who had sauntered downstairs to greet us. She's doing fine, and the only evidence of the day are a couple of shaved patches on her front legs that were made while they were searching for a vein for the IV catheter. It looks like she's wearing a tiny pair of Ugg boots. I'll try to get a picture of them before the fur grows back - it's adorable. Thanks for all the good thoughts today! They worked! Our wee girl did great! Delighted to hear the good news! Biggest yay of the day! YAY! Welcome home, wee girl! Glad everything went well. Also glad that you live at a time when we have all this great vet care available! Good! So glad to hear she came through fine! Even when there's nothing really wrong it's always a little bit of nervousness when they have to go under. I am so happy to hear this! I have worried all day about our Wee Wylla. Thank you, Laurie, for updating us on our special girl! Whenever I take one of my cats to the vet for a procedure, her sister hisses at her like crazy for a day or so. Do other cats do that or are mine just weird that way? That is a common thing. Cats recognize each other primarily by smell, so when they come back from the vet with different smells, it confuses their house mates. Huge thanks -- and many sighs of relief -- for the excellent news. Yay for clean teethses for Miss Wylla! I bet her Kitty UGG boots are adorable! Such good news, can't wait to see Wylla's cute little boots! So pleased to hear this! Yay for a healthy, happy Wylla! Let's see those choppers, Wylla! Glad to hear she sailed through! I don't know what painkiller they may have given her, but when my Linnet went to have his teeth worked on, the painkiller they gave me to give to him afterwards turned him from my aloof little lion into the most lovey-dovey, cuddle-demanding, loudly-purring lap junkie I've ever met. The effects only lasted as long as the meds did, but while they did it was just adorable. I recall a tech telling me once that something Aegir had had after her No More Tears surgery tends to make them see things that aren't there (etc). (Can't recall what that was; it's been awhile.) This was at a vet specialty hospital 50 miles away, and I had stayed through the surgery (which we had thought was going to be to look for missed ovarian tissue, but it turned out she had not ever been spayed as Shelter's info had had it, so she had a Gold Plated Routine Spay, LOL). And they were letting me take her home same day, due to the distance and since she was doing well and since they knew me well by then from Iapetus's bilateral VBO a month before. So I got some extra "parental ed" about after effects/side effects etc. Had read up, before Petey's surgery, too, and it sounds like pain control in cats is more complex than with other critters. (That would figure, as wonderfully more complex as they are in general!) Anyway, prayers going up for LG/his mom and all others who are stressed, with thanksgivings for Wylla's good experience. Glad it's helpful, LG's Mom. You sound a lot like hubby and me ("get a head start on my worrying, though ;-)"! Boy, they *are* our babies, aren't they?--from Anon @ 8:57.....Guess I should should have a name, LOL, and will make it *Arowyn* if the posting procedure will let me. (If any fellow Lord Of The Rings dorks here have already thought of that one and use it, please post, and I'll come up with something else, go with an ancestor of Arwen or Eowyn or something.) Anyway, T & P, LG's Mom, and hang in there. Now she can rival Malcolm for biggest smile! Much love to you tiny Wylla. You look great. Oh, I missed yesterday's post but glad to hear that all went well for Wylla. Our vet wants LG to have his teeth cleaned next visit and I've been apprehensive about anesthesia. Good to know that all went well with Wylla. 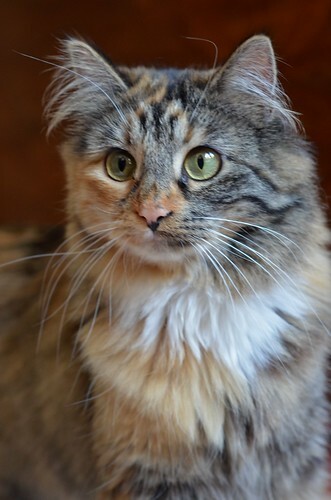 Wylla sure is a beauty :) She has grown to be such a beautiful cat! So glad Miss Wylla is doing fine. She's a luv. So glad she did so well. Sweet girl! Couldn't figure it out. Hubby is a Systems Analyst, LOL, but I'm the artsy type and only know computers make great typewriters if you type with 2 fingers LOL, though "typing" from 20 paw-pads makes them go nuts of course. I'll just start posts with: (from Arowyn).